The 12AR can be powered either by internal standard batteries or an external DC supply (4.5 V- 24 V), e.g. a mains/line adapter. It is built into a sturdy anodized aluminium cabinet. The polarization voltage for the microphones fitted to the preamplifiers can be set to 0 V — for prepolarized microphones, or 200 V — for externally polarized microphones. 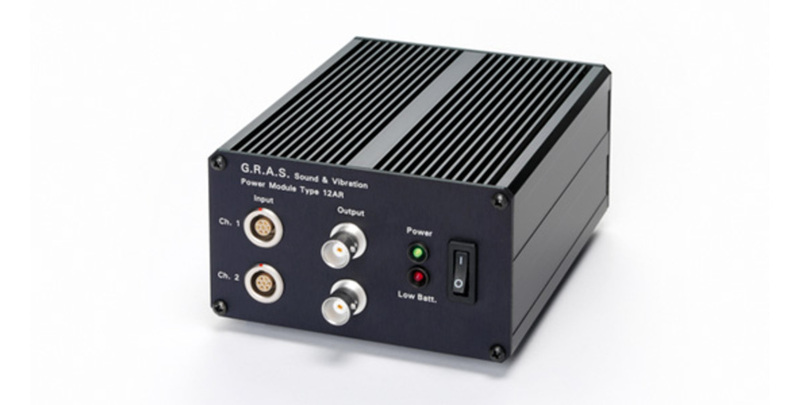 The 12AR also supplies ± 15 V to power the preamplifiers. It will run for approximately 30 hours on fresh standard alkaline batteries. A Low Batt LED indicates the condition of the batteries. The inputs are two 7-pin LEMO sockets on the front panel, which are wired up for GRAS microphone preamplifiers, e.g. 26AB, 26AC, 26AJ and 26AK, but is also compatible with other available makes of similar microphone preamplifiers. The signals from the preamplifiers are AC coupled to the outputs which are standard BNC sockets also on the front panel. All GRAS products are made of high-quality materials that will ensure life-long stability and robustness. The 12AR is delivered with a 2-year warranty. The warranty does not cover products that are damaged due to negligent use.